As we noted the day before yesterday, I now have a black 32gb Nintendo Wii U, the fruits of an ache-inducing trek thru a nippy Black Friday morning in Chicago. Now that I’v had some time to play both the bundled Nintendoland and the separately purchased Batman: Arkham City Armored Edition, as well as use the preinstalled Netflix, YouTube and Hulu Plus apps, I’ll attempt a more comprehensive review that builds upon my initial thoughts. The Verge has always had an excellent, nicely segmented format for their hardware reviews, so I’ll attempt something similar in this space. The Wii U is heavy. After picking it up at Target, I carried it around in an extra large shopping bag before having to switch it to a cloth Urban Outfitters bag, after it began to puncture the first bag. The package includes the glossy console box, the GamePad, AC adapters for each of them, and an HDMI cable – Nintendo has finally crossed-over into HD support. The “deluxe” edition comes in black and includes an additional cradle for the GamePad, two tripods for the console, and the great Nintendoland disc. The “basic” edition, which I have not tried, is white and does not include those items. The console was easy to set up and fit comfortably next to my TV. Although heavy, it is highly portable. After buying Arkham City at GameStop, they gave me a free Batman-branded carrying case that’ll come in handy for trips. A possible drawback, however, is the system’s absolutely massive charger – it’s a big, gray brick that I had to confine to one of the cubby holes in the Ikea cabinet beneath my TV (finally, that thing came in handy). The console box itself is no-frills. It has a slot for both proprietary Wii and Wii U discs, a power button, a sync button and a conveniently front-loaded set of USB ports and an SD card slot. The back has the adapter for the Wii Sensor, AV out, two more USB ports and an HDMI port. In terms of specs, the console has 2GB of RAM, with half of that reserved for the OS. It has an AMD Radeon GPU which projects the beautiful graphics that have become standard in the high-end games industry. Some may say “it’s about time,” but remember: Nintendo has never been about specs. It waited until 2001 to release a console that didn’t run on ROM cartridges, and the original Game Boy maintained its superb battery life by using a low-res, limited palette display. It also forewent HD the last time around in favor of the incredible intuition and simplicity provided by the Wii Remote. In these respects, Nintendo is a lot like Apple – it only adopts industry “standards” when it thinks they enhance the user experience, and are perfectly willing to be obtuse along the way. On the hardware side, what really separates the Wii U from the competition is the GamePad, which is much more than just a controller. It is also a TV remote, a standalone media viewing device and a bold foray into multiscreen gaming. For the past eight years, Nintendo has basically printed yen via its line of DS handhelds (the DS, DS Lite, DSi, DS XL, 3DS and 3DS XL), which exploited a novel dual screen setup with stylus input. In addition to presaging the advent of touchscreen gaming, the DS is clearly the predecessor to the Wii U, too – the GamePad even has an integrated stylus, and its quirky OS (more below) is more or less the same as the 3DS’s. Upon picking up the GamePad for the first time, I was surprised at how light it was. It’s lighter than an iPad, and it fits comfortably into either a two-handed (horizontal) or one-handed (vertical) grip. It has the same Home button as the 3DS, but its multiple analog sticks, trigger buttons and shoulder buttons actually remind me of the PlayStation Vita (maybe the black color did it). Everything is responsive and ergonomic. For users used to the iPad or the Nexus 7, the GamePad’s build quality will seem cheaper and chintzier by comparison, which it is. But it gets its various (and sometimes ill-defined) jobs done. The GamePad opens up a number of gameplay possibilities. In Nintendoland, it allows you to draw routes for your Yoshi-bot to follow (which it will then do, on your TV) or map out your routes in the Captain Falcon racing game. In Arkham City, it serves as your sonar display, or a mini-reader on which to check out the bios of various villains or as a radio of sorts – the various frequencies that you get to spy on are played through the GamePad’s tinny speakers, lending a nicely real-world feel to your explorations. The GamePad can also serve as a standalone gaming device – sort of. You can confine most games to a GamePad-only display while your TV plays Netflix or cable for example, but Nintendo does not yet seem to have given the GamePad free reign to a giant Vita or a geekier iPad. There have been some gripes with the GamePad, many of which I can understand. It has multiscreen disorder, making you sometimes “look” only at one designated screen at a time. It’s a power hog. And maybe it just doesn’t know what it wants to be yet. In particular, I think that in a living room that is increasingly populated with screens (looking up hints on your laptop, Tweeting from your phone), the Wii U’s insistence on having dominion over two screens at once (in most cases) could cut either way – it could either be a brilliant distillation of our appetite for ever-more screen real estate, or an exhausting exercise in multitasking, which is really bad for you, by the way. While its execution isn’t perfect (see the nauseating requirement that you “align” the GamePad with your TV in Arkham City to scan the evidence at the scene), the GamePad is something that, like the first iPhone, should get much better as developers tap into its potential (hell, it even suports haptic feedback!). Everyone (even while firing executives) pays lip service to multiscreen, cross-device interaction, but this is it, in the flesh pixels. Something is being born here, but it’s not perfect, not yet. Simply said, the OS isn’t good, and I hope that updates can make it run more smoothly. 15-30 second load times are the norm, and some thing are buried deep within various settings menus, making me pine for the unified settings centers of Android or iOS. Right out of the box, the system needs to perform a massive OS update that took me nearly half an hour to download and install. The eShop is an exception to this general sluggishness and counter-intuitiveness, however: AAA and indie games are easy to find and download, and the shop interface is noticeably zippier than the home screen and its apps. Be careful, however, if you’re using the white console, as the limited harddrive space (actually only 4GB) won’t last long in the face of scores of downloadable games and apps. YouTube, Netflix, Hulu Plus, and Amazon Instant Video are available on the Wii Menu (home screen) right away, and all work as expected. Nintendo did well in getting media compatibility to work out of the box (well, with that update) this time – the 3DS only belatedly got Netflix functionality, and the Wii, too, wasn’t exactly a media powerhouse out of the back. I felt comfortable navigating YouTube and Netflix in particular using the stylus. Wii Mode will restart your Wii U as an original Wii, so that you can play any backward-compatible Wii games. You’ll need a Wii Remote for this mode, however, as the GamePad will be turned off and is incompatible with original Wii titles. The Wii U has a varied launch lineup that should appeal to seasoned and curious gamers alike. Recent AAA standards like Assassin’s Creed III, Arkham City and Mass Effect 3 are all available in faithful HD ports, sometimes with extra Wii U exclusive content, such as in the case of Arkham City and its GamePad tweaks. The Wii U exclusive ZombiU is an intriguing survival horror-FPS hybrid. As mentioned above, Nintendoland is absolutely recommended – like Super Mario World, Super Mario 64 or Wii Sports before it, it’s a reliable first-party title that really gives you a feel for everything that your new system can do, from basic maneuvers to more eccentric nuances. 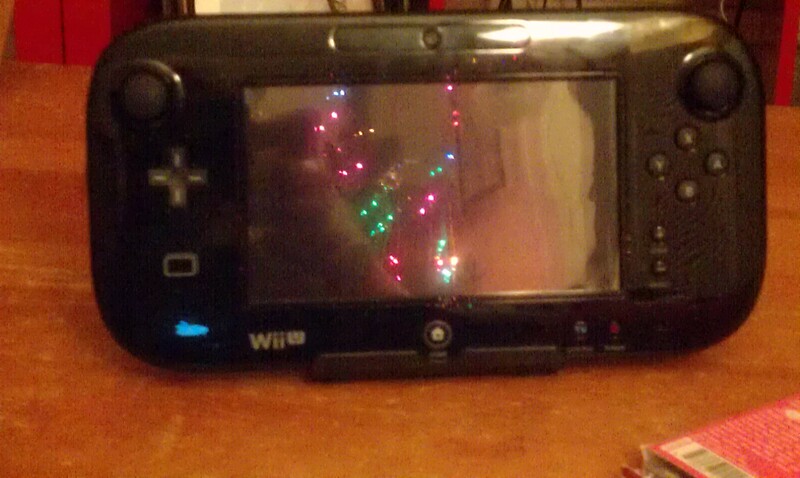 The Wii U represents one of the boldest – and at times, awkwardest – forays into integrating the multiscreen living room. It has respectable hardware, buggy software and an excellent launch game library, headed by the game that comes bundled with the black model. Don’t settle for the white model unless you absolutely can’t find or wait for an available black one – you’ll want the extra harddrive space for the eShop. If you like the original Wii or the (3)DS even a little bit, then this is a must-buy. It has the same novelty as the Wii, being something that both appeals to the casual gamer and delights the veteran gamer with its trailblazing approach. It takes the multiscreen format of the (3)DS in an exciting new direction, in which it sometimes feel that you have two different yet interacting games going on at once. However, it needs something else (other than Nintendoland) to show off the possibilities of its split-personality, just like Kirby: Canvas Curse did for the original DS back in 2005. Right now, it feels like many of the third-party developers (and even Nintendo itself, in some spots) approached the GamePad’s self-contained possibilities as an afterthought – it still spends a lot of time simply mirroring the TV display, which could be good (less multitasking) or bad (not novel/bold enough), depending on your perspective. I tend to be of the latter perspective, and I hope for more risk-tasking software down the line. For the time being, the Wii U is an extraordinary concept sometimes hampered by its v1.0 hardware and OS, as well as its inconsistent yet thrilling game library. There’s nothing else like it out there right now, and for that reason, I think it’s worth at least a long look from anyone remotely interested in console gaming.